from 5 Hours to 1 Hour Today! In short, this Google AdWords Keyword Multiple Match Type tool allows you to combine up to three keywords, create your own permutation list and include the necessary match types you want for your keywords. You can also use this generator to create SKAGs structure and BMM/Exact structure for your Google Ads account. 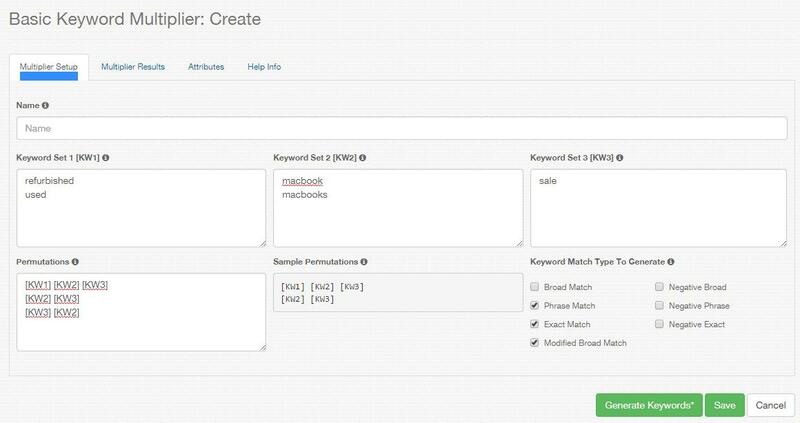 Here’s a screen shot of the basic keyword multiplier tool – configuration. Keyword Set 1, Set 2 and Set 3 let’s you enter all sorts of related keywords. Permutations allow you to enter your own keyword order. Let’s say you want all keywords from all columns or only two column to be included, this keyword multiplier tool is perfect. You just need to use the necessary tokens [KW1] which denotes the first column, [KW2] denotes the second column and [KW3] denotes the third column in each of your permutation list. I find in the past that if you are doing exact keyword it’s important to have different variety of keyword order. 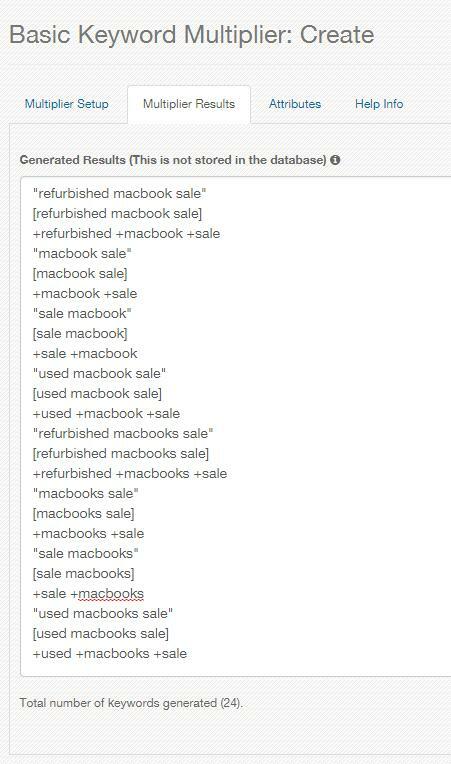 For example, if you have [refurbished macbook pro] exact keyword you will also want to have the [macbook pro refurbished] if you are not using BMM or broad modified match type keyword. 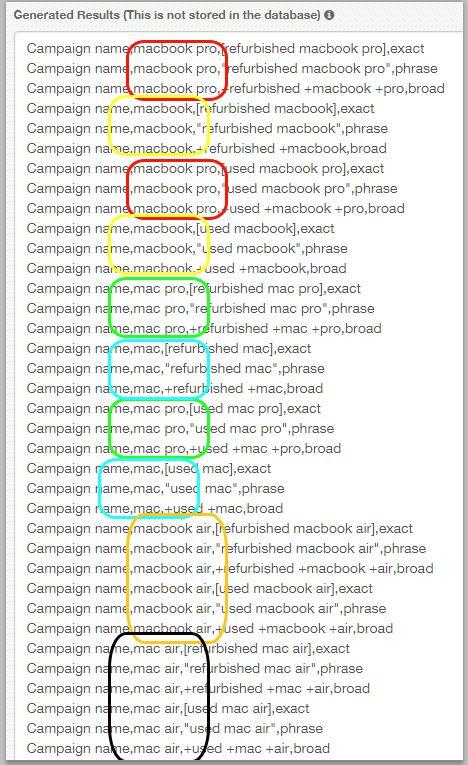 Even if you do use broad modified keyword match type both [refurbished macbook pro] and [macbook pro refurbished] will bring you sizable clicks this is what I found out when I was running Google Ads for Apple as an affiliate marketer. So really, I find variation of exact keywords is important when you are dealing with high volume keywords. And Keyword Match Type lets you generate the match type you want and allows you to include the keyword match type you’d like to include in the generated list. While the above let’s you use this keyword variation tool generate all sorts of keyword comibnation you would want, it’s not the only thing you can do. There’s more to it, the following sections, we’ll talk about how to use this keyword tool to generate hundreds of SKAGS or Single Keyword AdGroups, if SKAGs is your preferred structure and optimization process when you are building your Google Ads account or your client’s Google Ads account. I will also talk about how you can utilize this keyword match type generator to build BMM/Exact structure and optimization process as well. You will see in the next section below how you can use this keyword multiplier tool to generate the Google Ads Editor friendly rows so you can rapidly create your keywords and AdGroups in Google Ads Editor. You can use this keyword multiplier tool to create SKAGs or better known as Single Keyword AdGroups with 3 match types namely: exact, modified broad match and phrase. You would create this permutation list to achieve this goal, after which you would copy the results and paste it to your Google Ads Editor to create the AdGroups and Keywords. 1) The permutation is delimited by a comma character “,” so that when you paste it to Google Ads Editor it will recognize the columns. 2) Column 1 is the Campaign name which represents what campaign you want the adgroup and keyword to go to. 3) Column 2 is the AdGroup name [KW1] [KW2] [KW3] represents what the SKAG AdGroup name is. 4) Column 3 is the keyword in it’s form whether it be exact, broad modified or phrase. 6) You can add other columns as you wish like final url, label, etc. This is the output of the tool for Creating SKAGs (Single Keyword AdGroup with 3 match types.) And you will paste this to your Google Ads Editor Tool. When you paste it to your Google Ads Editor screen be sure to go the keywords screen and select the option My Data includes columns for campaigns and/or ad groups. And then paste the data and select the correct column headers so it’ll import properly. In this example, the keywords “refurbished macbook pro” (phrase match type), [refurbished macbook pro] (exact match type) and +refurbished +macbook +pro (broad modified match type) will all go to the adgroup with the name “adgroup name refurbished macbook pro”. What if you want to group products together inside AdGroups? While this is no longer quite a SKAG structure you can still create this structure using this keyword variation tool. And this is how you do it. And you’d like to use both Refurbished and Used keywords as modifiers. Keyword 1 column would have refurbished and used. This would be the permutation list you would use for such a structure. The first 3 lines will be for product combination of macbook and mac multiplied to pro and air. The second 3 lines will be for macbook and mac only keywords. This is the full screenshot of the configuration screen. This would be the output rows of this configuration – each colored box below denotes an AdGroup. 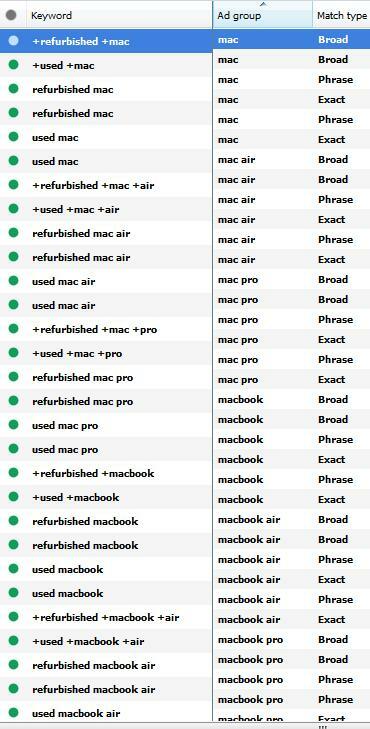 Interestingly, there was a GOOD consequence with this setup.. mac air keywords showed up which is what I actually wanted but have forgotten when going through the process, with permutations like this sometimes you cover more than what you can remember to include. And finally, here’s what this keyword multiplication process resulted to in the Google Ads Editor in the campaign/adgroup tree. Well, if you reall wanted to mix mac air and macbook air together, there’s no reason why you can’t just copy it on Google Ads Editor and move all keywords from mac air AdGroup to the macbook air AdGroup. And this is the result in the keyword list. You can see each keyword permutation is nicely placed in it’s corresponding AdGroup. Hopefully, that was helpful for you to understand what you can do with this variation tool. To create a BMM/Exact structure assuming you only want one AdGroup for exact and one AdGroup for BMM this is the permutation list you’ll need to create for this tool. 3) Column 2 is the AdGroup name represented by exact adgroup or bmm adgroup. 4) Column 3 is the keyword in it’s form whether it be exact or broad modified. 6) Just like before you can add other columns as you wish like final url, label, etc. This below image shows you how it will look like when you import it to Google Ads Editor Tool. The Campaign column will be filled with your campaign name. The AdGroup column will be either bmm adgroup name or exact adgroup name with the corresponding keywords for each group as well as their match type of criterion type. One thing I didn’t show a lot of is to create different Campaigns, this can also be achieved if you want to do separate perhaps keywords by product group or keywords by match types. 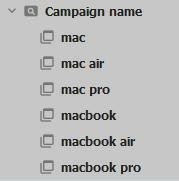 On the product groups, maybe you want mac pro in it’s own campaign and the rest of the macbook laptops can go into one campaign. As for the match types, I do a lot of peel and stick and have developed a framework called the kofa framework process where in a I put a lot of my exact converting keywords on it’s own campaigns so I can give them more budget. I will update this article soon to show an example on how you can use this multiplier tool to create multiple campaigns for different purposes.